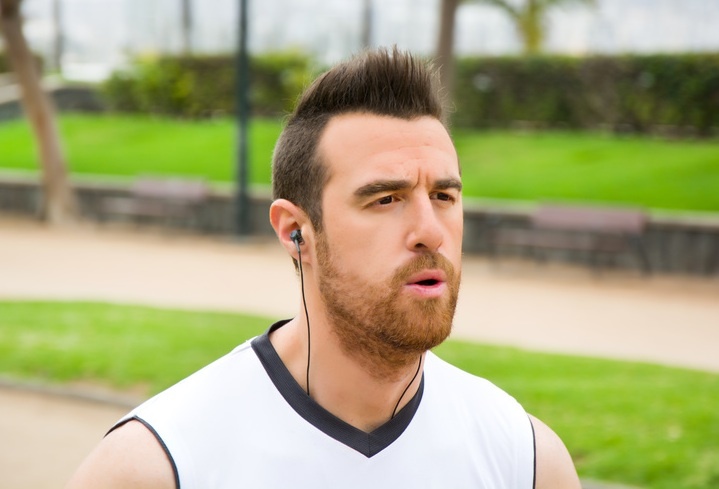 The guy who just jogged past you in the park couldn’t possibly have any idea how loud his breathing is. Which makes sense, since he’s wearing headphones, and the music he’s listening to is very loud, so loud that you were able to hear it also. But just barely, because his breathing was so loud. It’s deafening. It’s like he just escaped from having a plastic bag tied around his head. While he was underwater. It was a desperate breathing. A violent, wind-producing heave. “Hoo! Hoo! Hoo!” he breathed as he jogged past you. You could barely make out his blaring, driving electronic-sounding music under the ear-shattering inhales and exhales. There’s no way he knows. If he knew he’d quiet it down. Should you tell him? Run after him and tell him? Are you that kind of person, who tells complete strangers things like this? Socially embarrassing things? No. You’re not. Plus, he’s really far away now. He ought to be. He’s jogging really fast. That’s why he’s breathing so hard.